The students will use brush and ink to make a still life drawing of consumables. The student will demonstrate principles (unity, harmony, variety, contrast, and balance) and elements (line, form, shape, and value) of art. This project is also intended to raise awareness about packaged and manufactured food products that are consumed on a daily basis in contrast to fruits and vegtables. Still life, arrangement, contour line, consumables, packaging, value (light-medium-dark), tints, shades, cast shadow, contrast, form, and overlapping. Find discarded packages of consumed junk food around campus (or fresh produce). The empty packaging (or fresh produce) will serve as the subject matter for the student's composition. The objects will be alligned along on the table in a random order. The student will use observational skills along with pencil and paper to sketch out the still life. Once the still life has been drawn, the student will then use ink to add line, color, and shading (tint and values) to the objects on the paper. What were some of the challenges you had rendering/shading with ink compared with pencil, charcoal, or paint? Do you see packaging design as a form of art, why or why not? 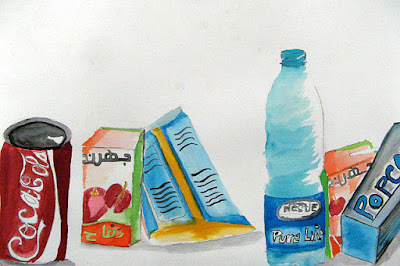 What do you think about the waste generated by packaging?